Slime mold is a term of convenience grouping together several kinds of evolutionarily unrelated organisms. They were formerly placed in the subkingdom Gymnomycota within the Fungi kingdom, because they produce structures containing spores (sporangia). The modern classification has them divided among several supergroups. 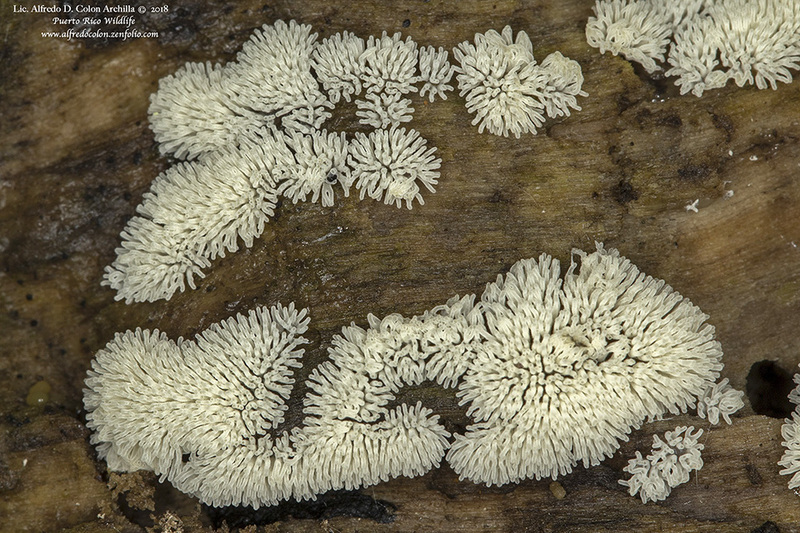 In taxonomic terms, the group slime molds is polyphyletic. The taxonomy of slime molds changes frequently—it is a work in progress. Their life cycle consists of a protozoa-like amoeba stage (plasmodium) and a fungus-like spore-producing stage. Wasp nest slime mold (Metatrichia vesparium) is common and widespread. It is found in Europe, Asia, Africa, Australia, and North and South America. In the United States it is common east of the Great Plains, including Minnesota, less common in the west. It grows in open forests on dead and rotting wood, especially hardwood. The fruiting body may be attached directly to the substrate or rise in a densely crowded group of up to twelve on a common stalk. The individual spore-producing structures are dark red or reddish-purple to nearly black, less than ⅛″ in height, and about 1 ⁄32″ in diameter. They are mostly cone-shaped and have a convex, shiny, iridescent, lid on top. When mature, the lid swings open like a jack-in-the-box, and the red or rust-red interior expands outward. When this dries out, the spores are disbursed by wind. Eventually, the expanded portion disintegrates. What is left looks like the nest of a paper wasp, giving this slime mold its common name. Slime mold is a term of convenience grouping together several kinds of unrelated organisms. They were formerly placed in the Fungi kingdom because they produce structures containing spores (sporangia). The modern classification has them divided among several supergroups. 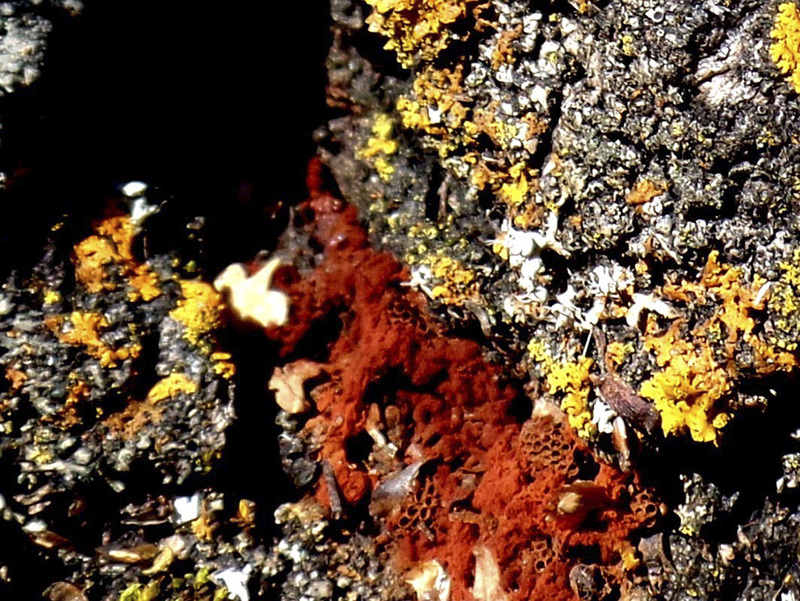 The taxonomy of slime molds changes frequently—it is a work in progress. 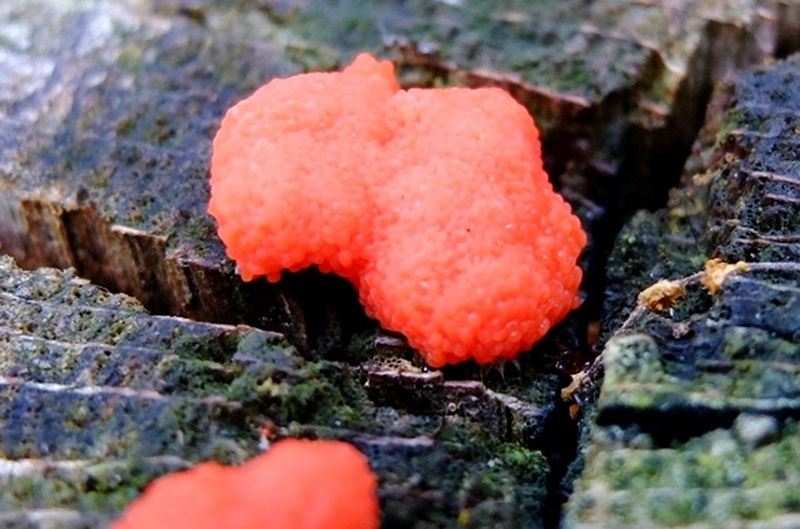 Red raspberry slime mold (Tubifera ferruginosa) is one of the most commonly encountered slime molds in woodlands. It appears from June through November as a pink to bright red, pillow-shaped, tightly-packed mass on well-rotted logs, sometimes on moss. The surface is knobby, like a raspberry. It is not edible.